Richard Bertinet shows this method in his book "Dough" and live on the free DVD that comes with the book as well. I'd heard from this book, his shop and the hands-on classes he gives. Saw his book in the shop. Looked at it. Put it down again. Walked away. Who needs yet another bread book. Second visit to the shop, looked at the book, walked away with it. It seems I needed another bread book. His doughs are quite wet, flour/liquid about 70%. Start with all ingredients in a large bowl. Mix with hands or dough scraper until all flour is moistened. Turn out on to an unfloured worktop. Yes, that is bare kitchen counter! 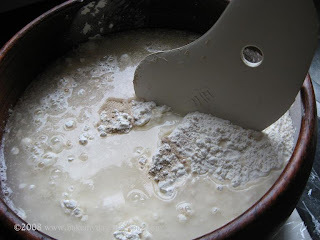 Next is messy (no pics here...) where you gather the mixture with your hands, using just your fingers as a kind of forks, pull it up like this: this is a little further in the process where the dough is becoming more coherent and somewhat less messy to work with, hands are getting cleaner. 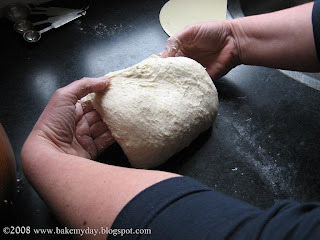 turn the dough a quarter (or grab it the other way round) and repeat the pull-slap-fold again. pull it against the counter to get that surface tension and repeat steps, you can feel the dough coming together and really see it puffing up; all that air trapped inside makes it supple, light and almost growing as you work it. It'll take less time than the traditional method; 5-10 minutes tops. 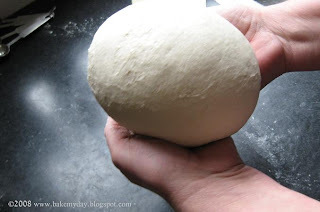 Resulting dough ball, ready to rise. 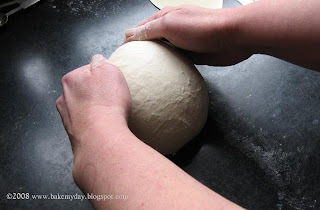 True, this looks kind of messy (and to be honest, it is) but it is less troublesome and takes less time than kneading the old way by pushing and pulling where you (I) get dough up to your armpits. It's a good work-out as well, and I secretly smile at the thought of my first -and only- dough workshop where the baker in charge tried to convince us to slap the dough on the counter.... Believe it or not, the man was called: Meelmuts! (Flour cap). Apparently the man knew what he was doing, too bad he missed the flair, the good looks and marketability of Mr. Bertinet! Knowing me and my fear of getting my hands dirty, this isn't exactly something I looked forward to trying...I did and was sold. First time I used it was on a 70% whole wheat dough which wasn't coming together. I had it in my stand mixer, and it wasn't going to get better than a sloppy gooey mass. Turned it out and followed above steps... lo and behold... magic dough. So I repeated it using Bertinet's white dough recipe and, convinced, decided to show you. I'm not sure about the book yet, at first glance I was mesmerized (pics! 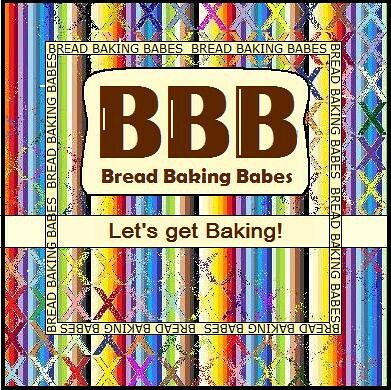 beauty breads!) but when I discovered that he derives his breads from maybe 3 recipes and varies with shapes and additions...Hmm. On the other hand, isn't that what we all do, more or less? I like the method, I like the shapes he is showing, and I love the step by step pics and handy dandy charts of how things are supposed to look. Golden brown? Dark brown? It's all there. Haven't baked much yet out of this book but that will follow soon I hope. Looks like lots of fun!!! That's beautiful! You are right on with my thoughts and I have two of his books. But now I see I need to try at least one of his recipes again. Your got such a great dough ball. I'm trying his technique with another recipe and it doesn't quite do like that. Great write up and wonderful photos. O yeah I remember mr. Paulie and his black shirt, hilarious posting that was! My sister has the book too and she thinks this method is fantastic. But it's nice to loose some stress slapping this dough around! BTW doesn't look too floury on your workingsurface, so it could work for me too..
Mmm, Monsieur Bertinet may cook in my kitchen !! And his methode works . Works perfect when you have a bad mood. Our children looked around the corner to see if I was shooting a gun (!!?? )....and then hide away from their "agressif" mother for the rest of the afternoon. 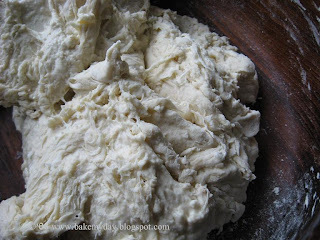 You can make a hell of noise with this dough and put lots of power and bad temper in it. Loved the pictures! And I have a great fondness for wet dough. 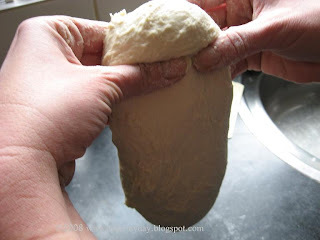 I think a similar technique is recommended for kneading a baguette dough. I just tried to shape a batard with your counter-checked metric units. Mooie foto's! Heb je nooit meel op je camera...?? Nice post! I will try the method you describe- I have always enjoyed kneading bread- this seems like a stress relief in a different method. Fantastic step-by-step. I've spent my whole day making my bread (you know the one I mean...) and I'm still not confident I got the steps right. Bread - sigh. I read regularly, but simply lurk. However, I made pizza dough (for the first time!) 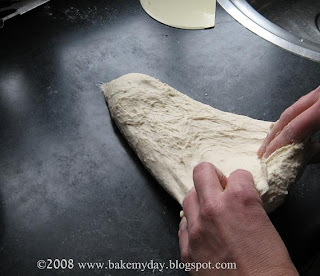 on the weekend, and while I was kneading away, I remembered reading about 'slapping' the dough. I slapped it, it worked beautifully. Then I got Boy out of his reverie so he could have a go too. :) Thanks for the great tip!